This Irish cap features the Guinness signature and pint design on the back. This embroidered Irish cap features GUINNESS and a pint on the front along with a functional metal bottle opener on the bill. 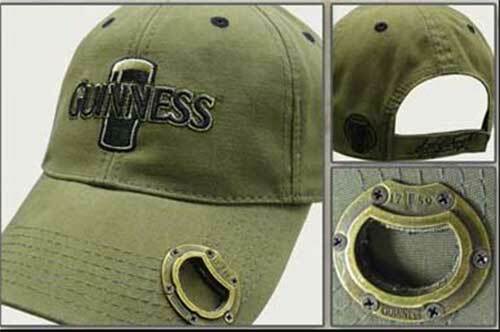 The khaki color Guinness cap has a Velcro size adjustment strap; one size fits most adults. This baseball style Irish cap is made of 100% cotton and is available at The Irish Gift House.